Assistant Student Life editor and IDX model Loli Lucaciu strikes a pose in clothing from the Daesha Vu collection. Last Saturday, the Identities Xposed (IDX) Fashion Show, an event featuring the sartorial creations of up-and-coming designers that were sported by Atlanta-area and Emory University models, was hosted in the Math and Science building. The IDX show’s main producer was College senior La-Quan X. Bates – Creative Director and owner of LXB The Style Coach, a style consulting service dedicated to enhancing the images of men. Our Assistant Student Life editor, Loli Lucaciu, recounts the experience of being one of the show’s models. “We are in this together. Identities Xposed on three!” Countless hands unite. A few seconds later they all simultaneously blow up in the air with an energy fed by excitement. The dynamic whirlwind of moving Barbies and Kens and the busy-bee-ing of designers and team members is hidden by dark drapes from the eyes of the spectators. The IDX Fashion Show has been in the works for months and this journey would reach its zenith tonight. “Q.U.E.E.N.” by Janelle Monae starts playing. I don’t know about others, but personally, I’m ready to get this party started. The models line up, and to my satisfaction, our line is boogying it up to the rhythm of the song. Following the show, this song would be one of the group’s hymns. Taking a closer look to the line, I see the girls with their smokey, batting fake eyelashes and sophisticated hair concoctions. We all look fairly glamorous, and the general mood is of enjoyment during these Cinderella-like moments. We take pictures (many!) and laugh and talk and be merry. We then, one by one, step into the limelight and showcase the creations of the talented designers and makeup and hair artists who so meticulously put together our looks. The runway was the place to be, but to get up there, we had to pass by the obstacle of the three killer steps. Always slightly crooked and shaky, they were the testing blocks to our success as models. However, by the end of the show, not a single one of us fell victim to this initial hardship. Up there on the platform, it was pure bliss. I revelled in the rush of the moment, forgetting the people watching, the tight clothes and the high heels… struggling not to walk on the beat, that killer beat … Back behind the scenes, the models sincerely high-fived each other. The thing is, not only the external part of this show was beautiful. 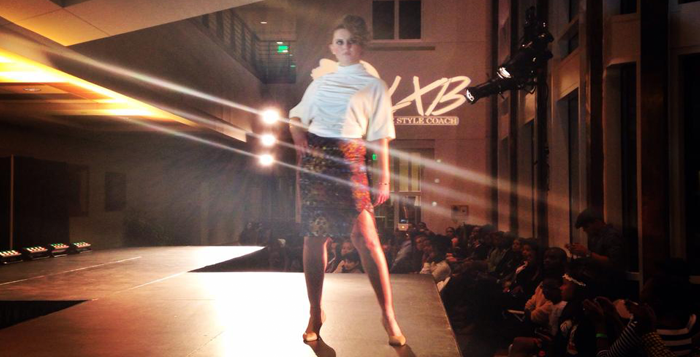 Yes, there was much work put behind every little detail, from the glamorous “LXB The Style Coach” logo projected on the wall and each individual piece of clothing, to the professional lighting and the elegant gentleman helping the models off the runway. All the alluring external pleasantries were, however, the result of the passion and the joy that the creative team, the designers and the models put forth. While all of us involved in the show knew about individual aspects of the show, it was quite a shock to see everything come together to form this grand-looking venue. La-Quan X. Bates, the mastermind behind the IDX event, received a standing ovation, and it was understandable: his dedication and work were of creative and managerial genius, and all of us involved in the show feel gratitude for working with such an inspirational person. The backstage team-shout at the beginning of the show became, by the end, one enormous group hug whose center, both literally and metaphorically, was La-Quan.